There's no shying away from the fact I'm a big Liu Bei fan. When the pair's haunting fragility came crashing in with such raw and honest lyricism there was no turning back from the awakening they characterised. From Infatuation's fraught honesty to its b-side Atlas World's jittering basslines and glassy synth pad textures, they've continued to go from strength to strength embarking on their own sound discovering journey. Here it looks like they've found what they've been searching for as the London-based duo return with Mind Over Matter - a track that's embellished in their expansive pop sensibilities. 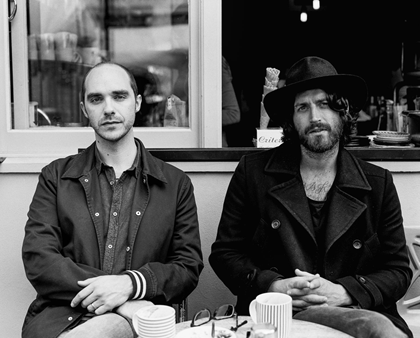 "When Liu Bei started it kind of felt like we were tweaking a radio dial, searching out our place in things" explains frontman Richard Walters. "Where we're at now is just a clearer, more focused, very slightly more electronic version of where we began...it's like we just came out of a reverb fog". Take a listen for yourselves below. The band's double a-side 7” ‘Mind Over Matter / Philip Seymour Hoffman’ will be released on September 25th via Famous Friends.